Bone metastases and movement disorders may prove good targets for focused ultrasound. Women with painful uterine fibroids who underwent MR-guided focused ultrasound (MRgFUS) since FDA approval of the technique in 2004 can attest to the benefits of this noninvasive outpatient procedure. As word spreads about its effectiveness in women’s health, MRgFUS is finding new potential targets within oncology, such as alleviating bone metastasis pain. In addition, focused clinical trials on brain function are showing some progress in the areas of movement disorders such as Parkinson’s disease and essential tremor. MRgFUS is a noninvasive technique combining a high-intensity focused ultrasound beam that heats and destroys targeted tissue with an MRI system, which visualizes patient anatomy and controls the treatment by continuously monitoring the tissue effect. In many cases, focused ultrasound can be performed without anesthesia, hospitalization, or ionizing radiation, allowing a quick return to normal activities and an improved quality of life. With uterine fibroids, the goal of MRgFUS is to treat as much of the fibroid as possible. This outpatient procedure allows interventional radiologists to target fibroids with high doses of focused ultrasound waves to shrink or destroy the fibroids without damaging surrounding tissue. MRI is used to locate fibroids and establish the proper ultrasound pathway, keeping healthy tissue safe from the ultrasound waves used to attack fibroid tissue. MRI use also is a good way to determine the size of fibroids. While focused ultrasound is increasingly used in the treatment of uterine fibroids, hysterectomy remains the gold standard for the treatment of these painful growths. According to Anne Roberts, MD, division chief of vascular/interventional radiology and a clinical radiology professor with UC San Diego Health System, much of that is because of reimbursement and insurance coverage issues for the focused ultrasound procedure, which can be costly. Establishing a specific CPT code for MRgFUS could help, but there’s also the matter of the time involved in setting up and completing the procedure, which may tie up a busy MRI suite. There’s also the matter of how much time the physician needs to spend on this procedure. “You can’t designate this procedure to a technologist,” Roberts says. “So then you have the issue of a physician dedicating four to five hours sitting at the machine.” She says that by the time a woman is diagnosed with uterine fibroids, the fibroids tend to be large in size and require a significant amount of time to treat. Focused ultrasound is making inroads in the oncology world since the October 2012 FDA approval of MRgFUS ablation therapy to alleviate pain caused by metastatic bone tumors for patients who cannot undergo or have not responded to radiotherapy. With bone metastasis pain affecting nerves that are located close to the surface, the standard treatment for such pain is radiation therapy. ExAblate targets nerves near metastases for ablation, easing pain symptoms, according to the manufacturer’s phase 3 clinical trial data presented to the FDA as part of the company’s premarket approval application. MRI is used to plan and provide continuous guidance for targeting the diseased tissue, noninvasively provides real-time temperature measurement, and monitors treatment outcomes. Patients have reported reduced pain and lasting improvements in well-being and function as well as a decrease in the need for medication. “Bone metastasis has the real potential for improving the use of this technique on a more widespread basis,” Roberts says. Meyer adds that side effects from MRgFUS are short lived, with some residual inflammation and soreness in the treated area that lasts only a few days. The standard treatment of radiation and chemotherapy works for some patients but not without its own side effects. It can take two to three weeks after radiation therapy for the patient to feel better, he says. According to Golumbic, researchers are taking steps to determine whether transcranial MRgFUS could offer a better and more noninvasive treatment alternative to traditional treatments for Parkinson’s disease, essential tremor, and other movement disorders. Results of a phase 1 trial out of the University of Virginia, recently published in The New England Journal of Medicine, noted that ultrasound can be focused through the scalp and skull with sufficient precision to reduce tremors by creating a small ablation deep in the brain. The 15 study participants, all suffering from essential tremor, saw significant improvement in their dominant hand tremor. Overall, participants reported substantial improvement in their quality of life, with essentially no residual disabilities from their tremor at one year after treatment. Schwartz is involved in ongoing trials in Canada examining how MRgFUS can be used as an alternative to treatments such as lesioning and deep brain stimulation to treat patients with essential tremor who have not responded to medication. Although often effective, he says traditional treatments come with the risks associated with any open neurosurgical procedure, such as infection. Also, with deep brain stimulation, the process is reversible, meaning that once the stimulation is turned off, the effect goes away. With some initial success in MRgFUS treating brain-related issues, Golumbic says researchers are looking into other conditions that stem from the brain, such as neuropathic pain, also referred to as “phantom pain,” and treatment of obsessive-compulsive disorder. “The thinking is if it works in these areas, it could open up the entire psychiatric spectrum,” she says. Clinicians working in the field see a variety of applications for MRgFUS on the horizon. For example, Roberts says there is the capability for targeted drug delivery, which allows physicians to generate higher toxicities at the targeted volume while sparing the entire body. A nanoparticle could be injected into a tumor and then activated by ultrasound. There also is work under way in the treatment of primary cancers as well as noncancerous issues such as lower back pain. In the case of MRgFUS applications, as more favorable results are revealed from studies around the world, Roberts believes there is a greater likelihood for adoption and an increased focus on what can be done with this noninvasive technique. — Kathy Hardy is a freelance writer based in Phoenixville, Pennsylvania. 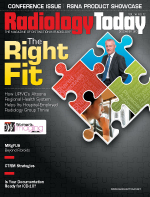 She primarily covers women’s imaging topics for Radiology Today.